Patinated and ormolu bronze piece representing Mars and Venus, an allegory of the wedding of Napoleon I and Archduchess Marie Louise of Austria. By the famous bronzier Pierre-Philippe Thomire, c. 1810. A French Empire-style mantel clock is a type of elaborately decorated mantel clock made in France during the Napoleonic Empire between 1804–1814/15, although the timekeepers manufactured throughout the Bourbon Restoration (1814/1815–1830) are also included within this art movement since they share subject, decorative elements, shapes and style. Already by the end of the 18th century, from the mid-1770s on, the French clocks participated of a new art movement; the Neoclassicism. The predominant style in architecture, painting, sculpture, and the decorative arts, that had come into its own during the last years of Louis XV's life, chiefly as a reaction to the excesses of the Rococo but partly through the popularity of the excavations at ancient Herculaneum and Pompeii, in Italy. Therefore, the clocks also did without the excessive ornamentation and overelaborate designs of the preceding Rococo style so typical of the Louis XV reign. 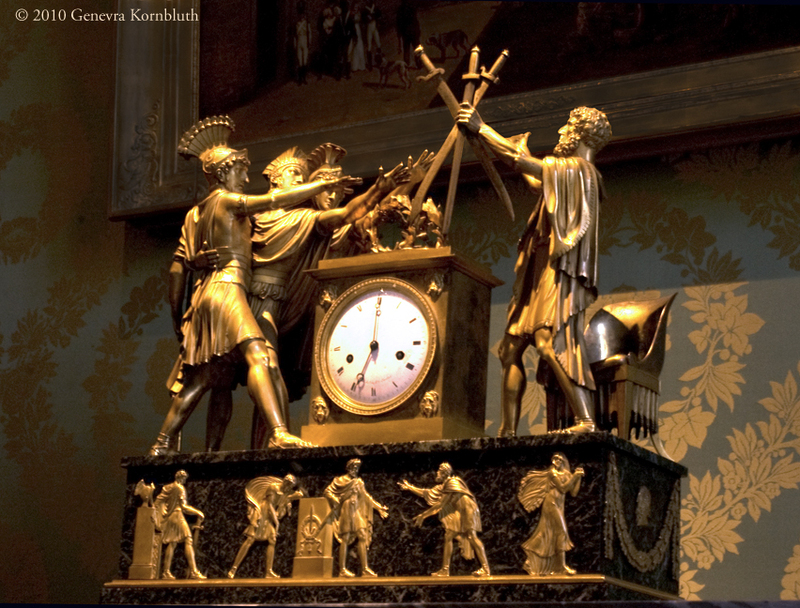 The timekeepers manufactured both over the Louis XVI and the French First Republic historical periods incorporated this new artistic language with classical designs, allegories and motifs. In the case of the Louis XVI pieces, stone (usually white marble, alabaster or biscuit) was combined with gilded and/or patinated bronze, although certain cases were completely cast in bronze. Some models were architectural (i.e., with no figures) while others displayed classical-style figurines. During the 1790s, the production of gilded-bronze considerably increased as working conditions became easier. The freedom of trade initiated by the French Revolution allowed many casters, who during the ancien régime worked in workshops strictly limited to making bronze, to develop large factories. They took advantage of this opportunity to execute all stages of bronze making within one factory and drew, cast, gilded, assembled and sold objects of their own workshops. Artisans still benefited from pre-Revolution training and worked according to the standards of a luxury art from the ancien régime, but they had better means of production and organization. Two sketches representing; an allegory of "Music" on the left and the "Genius of Arts" on the right. The use of gilt-bronze to make luxury goods could be argued to have reached its peak at the beginning of the 19th century in France. This medium was not new, as it had enjoyed international reputation in Europe since the reign of Louis XIV that continued during the entire ancien régime. One reason for this success is the technical qualities inherent in bronze. Cheaper than gold and silver, it is a common material easy both to mold and ennoble by gilding with mercury. For this reason, it became the favorite material for clock cases, candelabra and furniture ornaments. Thanks to the skill of remarkable bronze casters and chasers these objects were not merely timekeepers, but became objets d'art. This golden age ended in the late 1820s, when the generation of craftsmen and laborers died out, cheaper metals started to be more increasingly used (e.g. brass) and bronze casting entered into a higher mechanization, sacrificing craftsmanship in furtherance of productivity and reduction in costs and manufacturing time. In the Empire style timepieces, bronze was the main material used and both the patinated and specially ormolu techniques were extensively used, reaching its zenith during this age. Indeed, the fine modeling, gilt and patina finishes used in these series-produced pendulum clocks are matchless. Most cases were totally cast in bronze and others combined with a stone base made of marble, alabaster or porphyry. However, wood (mahogany or fruit wood) and carved crystal (the latter used during the Restoration) were (less frequently) employed too. During this period there were between 40 and 60 workshops with founders, gilders, silverers, and chasers in Paris. The founders usually made a wax model from a draft and from this wax model a negative plaster cast was made, which could be reproduced more often. Then using this plaster cast a mould was made, in which the bronze was cast. By combining figures and mountings several versions of one design were produced. A sort of mask used to protect the gilder from the poisonous mercury fumes. Due to exposure to the harmful mercury fumes caused during the "dorure au mercure" (fire-gilding) process, unfortunately most gilders did not survive beyond 40 years of age as a consequence of mercury poisoning. Even in those days, they took all kind of precautions, in particular chewing bread, better companies gave them a piece of leather to be placed over the tongue then a silver coin on it and at the end of the day the coin had "turned" to gold, there was also a kind of mask devised to inhale the air from behind the head, but none of these measures were in any way sufficient. This provoked that the use of this hazardous chemical element was outlawed by the French legislation after around 1830, although continued to be commonly employed until circa 1900 and even was still in use around 1960 in very few workshops. To replace ormolu, other gilding techniques (like electroplating from the mid-19th century on) were utilized instead. Regarding the mechanism, towards the end of the 18th century, round clock movements became a reliable mass-produced product. Known as "Pendule de Paris" (Paris, or French, clock movements), they were an 8-day movement with anchor escapement, silk thread suspended pendulum with a count wheel striking on a bell every hour and half-hour. By the 1840s the simple and very effective silk suspension was being replaced by various adjustable spring suspension systems. It is necessary to emphasize that unlike the clocks built in the 18th century, where the majority of them were signed, the authorship in many of the Empire ones remain anonymous, making it difficult to attribute one particular work to a certain bronze sculptor. To this must be added that it was a common practice among bronziers selling pieces to each other and even to copy or readapt others' designs. When signed, they usually bear the name on the dial and could be the bronzier's name as well as the retailer's name or the movement maker. About 10% for the model design. The movement only represented between 5 and 10%. This meant that about 90% of the production costs were the sculpture and the case making. C. 1810-1815 piece presenting George Washington in full military dress. Metropolitan Museum of Art. The clocks were manufactured following the style then in vogue, the Empire style, a phase within the Neoclassical scope, based on the classical antiquity art; both the ancient Greece and specially the Roman Empire. Although there were a great diversity of case shapes, the most common and popular ones were the clocks with a rectangular or oblong base sustained by four (or more) legs of different forms and patterns. The pedestal front was normally decorated with either garlands, acanthus tendrils, acroterions, laurel wreaths, scrolls, flowers and other classical decorative motifs, or depicting finely chased mythological and allegoric scenes in relief as a frieze of a Greek-Roman temple. On top of the base (in the center or to one side) sat the plinth that accommodated the clock dial, however in other models it was also placed in cart wheels, rocks, shields, globes, tree trunks, etc. These timekeepers were embellished with fine bronze figures of art, sciences, and high ideals allegories, gods, goddesses, muses, cupids, classical literary heroes and other allegorical or mythological compositions. Sometimes historical personages such as Alexander the Great, Julius Caesar, George Washington, Napoleon Bonaparte, philosophers and classical authors, were the main theme as well. Hence they are also known as figural or sculptural clocks (rather than architectural). 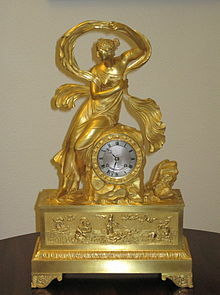 An 1822 clock depicting the nereid Galatea, Catherine Palace. The respective allegoric composition in relief of the frieze, represents the "Triumph of Galatea", based on the homonymous fresco by Rafael Sanzio. Likewise, another of the sculptor's source of inspiration for the composition of a certain design were both classical sculptures and celebrated paintings. Examples of the first one include the Sleeping Ariadne and Psyche Revived by Cupid's Kiss by Antonio Canova or Psyche crowning Amor after a model by Claude Michallon. In painting can be quoted the Oath of the Horatii by Jacques-Louis David, Héro et Léandre by Pierre-Claude-François Delorme, etc. The classical gods served as models and symbols for the era. For instance, the chariot clocks or "pendules au char" were an exceptional category within the Empire clocks. Apollo, Diana and Cupid depicted as triumphant chariot drivers, were the most popular gods used. It was habitual during the Napoleonic times and particularly under the "Directoire" and "Consulat" regimes that clocks glorify the conduct of warfare. More domestic and romantic subjects, like the "temple of love", gained popularity after the downfall of the Napoleon's Empire. During the Restoration (1815–1830) the representation of warfare scenes was not as common as in the early Empire. Finally, under the reign of Charles X (1824–1830), the case designs started gradually to develop away from a proportionate and strict classicism towards a baroque style which announced the eclecticism and historicisms in forms, so typical, on the other side, of the rest of the 19th century. That's why during the second half of that century and early 20th, among all of the different revival styles of mantel clocks available; Rococo, Louis XVI, etc., timepieces in the Empire style were made as well, normally they were replicas or adaptations based on preexisting models. Empire clocks in general and the largest and most notable examples in particular from the top bronziers, such as Pierre-Philippe Thomire, Claude Galle, André-Antoine Ravrio, Louis-Stanislas Lenoir-Ravrio, etc., are considered more than just clocks. They are works of art as well, sculptural études, where the balance in composition and the study of objects, animals and the human bodies forms and expressions are carefully and meticulously reflected in the bronze figures, achieving a high degree of realism, perfectionism and delicacy. These timepieces were devised to decorate the console tables or mantelpieces of a given hall or room in palaces, European and American mansions, houses, offices, etc. Today many of them are part of royal collections and can be seen in palaces, official residences, embassies, ministries, museums all over the world, etc. Even nowadays a few companies replicate this style, proving that the attention to detail, exquisite taste, superb workmanship, elegance and refinement achieved by the different artists and craftsmen involved in its manufacturing, are everlasting and timeless alike. Denière et Matelin. Named for Jean-François Denière (1774–1866) and François Thomas Matelin (1759–1815). François-Aimé Damerat (active between 1781–1819). François Rémond (or Raimond) (1745/47–1812). Gérard-Jean Galle (1788–1846). The eldest son of Claude Galle. Louis-Stanislas Lenoir-Ravrio (1783–1846). The adopted son of André-Antoine Ravrio. Louis Thomire (1757–1838). Collaborator and cousin of Pierre-Philippe Thomire. Lucien-François Feuchère (c. 1760–c. 1841). The son of Pierre-François Feuchère. Pierre-Etienne Romain (c. 1765–after 1821). Mantel clock with mercury gilding in the shape of an urn (around 1800) by Julien Béliard, Paris, maître horloger recorded on the rue Saint-Benôit and rue Pavée in 1777, still active in 1817, or Julien-Antoine Béliard, maître horloger in 1786, recorded on the rue de Hurepoix, 1787-1806. Napoleon's timekeeper in the shape of an amphora (1806). Another bronze urn clock that belonged to Ernest Augustus, King of Hanover (circa 1810). Pendule à cercles tournants (Rotating circles clock) portraying the allegory Time and History, by Pierre-Philippe Thomire (1812). Royal Palace of Naples. Set of clock with a figure of Minerva and candlesticks purchased in Paris in 1817 by James Monroe. Clock depicting Hannibal by Denière et Matelin (1817). Displayed in the Blue Room of the White House. Piece with the case made of alabaster, c. 1818. Gatchina Palace, Russia. C. 1825 exemplary presenting an allegory of Hope. A transitional example (c. 1830), representing the Emperor Nero. In the base can be observed a clear tendency towards a baroque style. Empire revival timepiece (2nd half 19th century) with the figure of the goddess Aurora. Replica of a preexisting model. ^ "Louis XVI style". Encyclopædia Britannica. ^ a b "Pier Van Leeuwen, Empire mantel clocks: A golden dream in timekeepers". zaandam.klokkenmuseum.info. 2003. ^ a b Pier Van Leeuwen. "Empire-style mantel clocks: A golden dream in timepieces (2003): p. 2 exhibition catalogue" (PDF). ^ "Feuervergoldete Bronzeskulpturen der französischen Pendulen des Empire 1796 - 1830". alte-spieluhren.de. Wikimedia Commons has media related to French Empire style mantel clock.